Once you go thru our website you will know more about us. We travel all thru the USA buying these Antiques, Vintage Signs, Old Antique Advertising , Collectible Signs, Gas & Oil Advertising signs, Motorcycles, Motorcycle Parts Etc.etc. For the People Contacting us about appraisal or “what is my sign worth ? As a child i always liked to collect “something”. 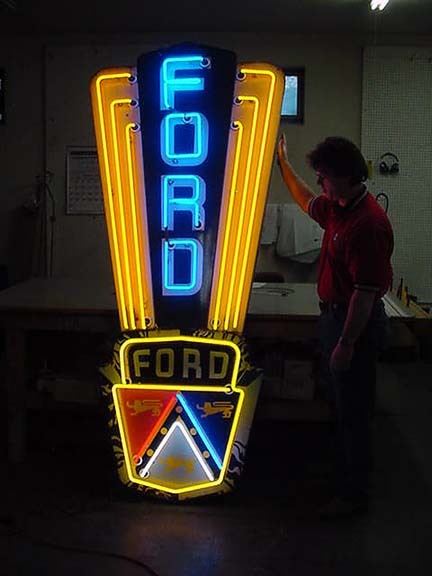 In the 1970’s I started buying a few Vintage Coca Cola signs and other old signs..Also in the 1980’s I worked in the oil fields of Wyoming, hence I started collecting gas & oil memorabilia…Also started collecting VINTAGE NEON CLOCKS, OLD PORCELAIN NEON SIGNS which were large. These signs were much cheaper back then however the car collectors have discovered them for the big collector car buildings. This has great driven up the price of large signs. There are many car collectors so the price has skyrocketed for large vintage signs..Therefore this trend is still happening and world record prices are being set..